Field Sports - Cocker Spaniel - print only by Nigel Hemming // £180.00. This is the Cocker Spaniel from Nigel Hemming's latest range which he has dubbed the 'Field Sports' series for 2014. This is Nigel's first published image of a cocker spaniel since 'Cocker-The Woods' all the way back in July 2009 & the feedback from customers has been amazing. 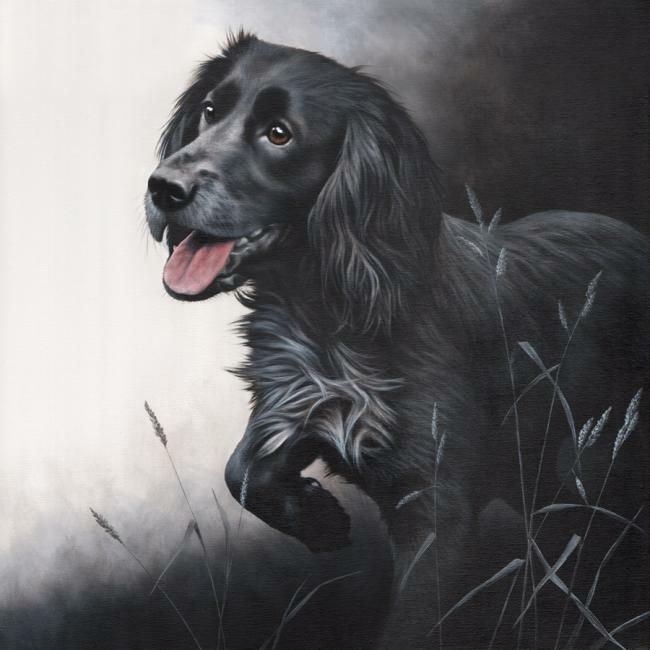 Nigel as you may know is an artist that has painted many animals over time including birds, which is how he originally began but he is known for his canine art and specifically his gun dog originals and limited edition prints. It seems fitting that Nigel returns to paint a Cocker Spaniel (a Gun Dog) as he is so adept at capturing their faces perfectly. With 'Field Sports - Cocker Spaniel' you can almost see the dog's innocent inquisitiveness & his innate intelligence.